In 1909 Wilbur Wright traveled to France to demonstrate his flying machine with the hops of getting orders for this new marvel. His flying was the rage of the day and as was common in that era, souvenir pins were made to honor the event and sell to the public. Just as we can buy pins at air shows today. 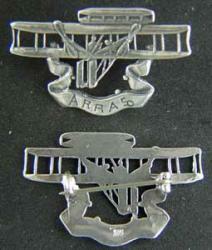 This is a museum quality reproduction in sterling silver of an extremely rare pin from Arras France.